Steve Wozniak, who co-founded Apple Computers with Steve Jobs, will speak at UB on Wednesday. Steve Jobs is remembered as the visionary founder of Apple Computers, a marketing genius who helped to launch the computer revolution in the 1970s and who returned to the company in the late 1990s to drive the creation of the iPod, the iPhone and the iPad. But Jobs couldn’t have done it without his co-founder, Steve Wozniak, a self-taught technology whiz who designed the groundbreaking Apple I and Apple II personal computers. The machines – particularly the Apple II, which boasted a keyboard, color graphics and a floppy disk drive – brought the computer from the worlds of business and academia to the home. Wozniak, known as “Woz,” left Apple in the mid-1980s but his influence on the tech world remains strong. He promotes creative thinking and access to technology in schools, he is a founder of the Electronic Frontier Foundation digital-rights organization and he has collected a series of national honors for his work in computers. On a personal note, Wozniak appeared on “Dancing With the Stars” in 2009 and he’s an active Twitter user who regularly posts on his travel and dining experiences on the speaking circuit. He often waits in line to be the first to buy the latest Apple innovation at a company store near his California home. 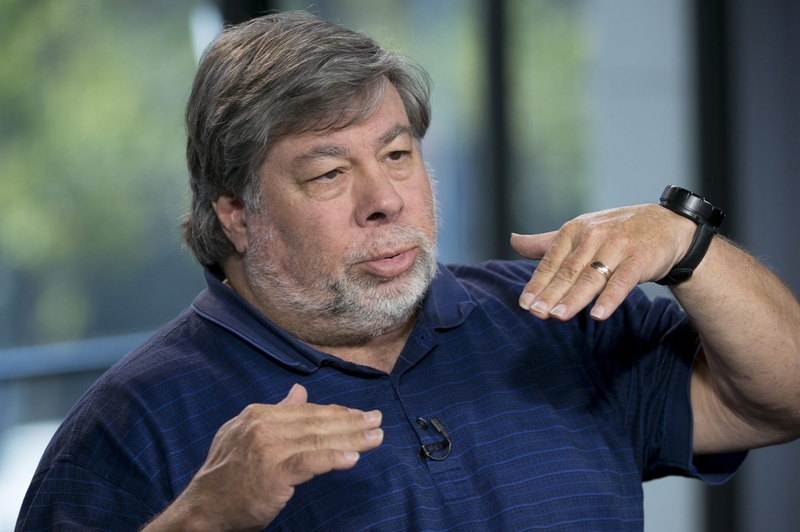 Wozniak, who is appearing at 8 p.m. Wednesday at the University at Buffalo as part of the school’s Distinguished Speaker Series, said he hopes to take a trip to Niagara Falls while he’s in town. Q: When you began working with computers, in the 1970s, did you have any idea how much they would change our lives? A: We just wanted technology to be important and really help mankind do more than it could. We had incorrect visions, maybe, of where it would get, how far, what today would be like. But we had the starting point. And one of the big parts of the starting point is to develop computers, which are platforms, and from that other people can write software. Hundreds of thousands of bright people can write software, develop hardware that extends its abilities, etc. Q: What took the computer from something that businesses and hobbyists used to something people wanted in their homes? A: Computers were dry, stale, boring tools for engineers and scientists, maybe. And that was a challenge that, really, Apple was one of the foremost companies to address correctly. You had to be out of the box, open a manual and start using it from Day One – not have to learn everything about computers just to operate it. And luckily, it was just the right point in time that everything to do that was possible. I’d been through the earlier stages of computers, where you had to be an expert just to use it, turn it on, do anything. And I didn’t want that. I worked at Hewlett-Packard. We had nice, friendly calculators that made sense to normal human beings, and that gave me a lot of inspiration. It had to be productive and it had to be fun. Q: You and Steve Jobs were successful business partners with very different personalities, right? A: He was just the most energetic, you know, spirited, marketing leader. Just believing in everything. Even if he didn’t really know something. He always had a very outgoing presence. I was very introverted and shy and quiet, and I was a super designer. And nobody could ever beat me at that. Steve Jobs is the one that always wanted a company, wanted to be important, and you had to have a company to be important. And me, I was just more – I wanted to be the world’s greatest engineer, and build these products that, more than anything else, I just wanted ’em for myself. Q: Apple has been so successful at coming up with new products and convincing people they need them: the personal computer, the iPod MP3 player, the iPhone smartphone, the iPad tablet. Can they do it again with the Apple Watch? A: Largely, it’s an internal sense of where it’s going. And, you know, there are Apple products that I line up and I’ve got to have every single product. But I didn’t buy the latest Mac Pro. Maybe it didn’t fit my life. I’m going to get the watch and try it, but I can’t tell you until I have one if I think it’s a real huge thing that a lot of people need. I’m skeptical, still, because I’ve had smartwatches from other vendors that did not pan out, and didn’t really give me some new thing in life that I didn’t have, in maybe a better form, with my phone. Q: What qualities do you, Steve Jobs, Bill Gates, Jeff Bezos, Mark Zuckerberg and other far-sighted company founders have in common? A: Well, No. 1 is, have a company make money. That’s the only way you can get your product to the world. You don’t have profits, you can’t build the next one. And No. 2, for Apple especially, was only make quality products. And you just don’t put out some stuff that, oh, it’s some general thing that we know how to make. So, we’ll go make some money. No, put out the exceptional products that command a high profit margin. So, that’s Apple. Q: Companies such as Amazon, Uber and Airbnb have disrupted the retail, transportation and hotel industries. On balance, is the short-term pain to traditional companies, and their workers, in those industries offset by the value they provide to consumers? A: I’ve always believed that, in my entire life, change is necessary and there’s always a little bit of bad that comes with the good. And things that you loved and meant a lot to you in your life have to go away. That’s the goal of technology, and I’m a technologist. You know, I was asked recently what’s your most important or favorite product ever from Apple? And you know what my answer is? It’s the App Store. It just changed life – you mentioned things like Uber and Airbnb – it just changed my life and the way I live so much more. And if you think about it, the App Store wasn’t even part of the first iPhone.